If you feel you don’t have room in your kitchen for lots of gadgets to make cooking a bit easier then maybe you should invest in a multi-cooker. A multi-cooker usually has more than one function so you can use it as a slow cooker and a rice cooker and even a mini-oven depending on how many functions it offers. You have the benefit of saving money on buying different appliances by having them all in one. Today we’ll give you an overview on the Top 10 Best Multi Cookers 2018 so you can see what’s available and what they can do. Check out the best seller, Tefal RK705840 Multicook Plus 10-in-1 Multicooker if you want to save some space in your kitchen. We’ll be looking at what size the multi-cooker is, what functions it offers and what the price range is so you can see what you get for the money. If you’re on a budget you can find the best for you in your price range. The Tefal RK705840 is a smart looking white multi-cooker with a black lid, it has a 5 litre capacity which is great if you have a few to cook for or if you want the capability for batch cooking. There is a LED display on the front with simple selection buttons to make this very easy to use. The inner pot is non stick with measures on the side to help you add the right amount of liquid. If you like to make stews, want to make rice or even bake a cake you have the option to do them all in this multi-cooker. Make your own yoghurt, which is very easy to do, have the flexibility of a delay timer and if you’re not quite ready to eat when the programme is finished then you know the food will still be hot because the keep warm function will kick in at the end of cooking. The steam basket and rice cup are included with the multi-cooker so you have everything to get started. With a price less than £60 at the moment the Tefal RK705840 is good value. The Russell Hobbs Multi-Cooker 21850 is a 5 litre capacity in a very stylish silver and black colour. It’s 39 x 26.5 x 23.5 cm in size with a removable inner pot which is non stick and easy to clean. You can cook rice in this multi-cooker and the measuring cup is included. You can slow cook, steam and you also have functions for meat, fish, stew, soup, yoghurt, porridge, bread and cake. There is a steaming tray included which fits over the bowl and can hold your fish, meat or vegetables. You also have a yoghurt function and making yoghurt is so simple everyone should try it. The Russell Hobbs Multi-Cooker 21850 can even be used as a mini oven as it allows you to bake bread and make a cake. This isn’t a pressure cooker and because of that you can open up the lid and check your cooking or change functions if you want to pre-cook your meat and vegetables before slow cooking. This is large enough that you can cook for a large family or batch cook for the freezer. At under £70 at the moment of writing this could easily fit a family budget. The Tefal RK812142 MultiCook Advanced 45-in-1 Multicooker is a white multi-cooker with a viewing window in the lid and a carrying handle to make it easier to move around. It’s got a 5 litre capacity, big enough to feed a few people or make something to last a few days. There are different cooking selections, baking, soup, steam, stew and crust fry. With each of these you can select fish, chicken, meat and vegetables and it will give you pre-set times. There are other functions like the porridge, rice and yoghurt, more than I have space to mention here. Although it doesn’t have a specific slow cook function, the Tefal RK812142 has the ability to adjust the temperature and time of the cooking selections or just choose the diy button and set what you want. There is a delay timer and a keep warm function which gives a good all round multi-cooker. The steam basket sits on top of the inner bowl so if you want to steam some vegetables while cooking your stew you can. The price being under £75 for the number of functions is very reasonable. The Lakeland Mini Multi Cooker is a small multi-cooker perfect for individuals or couples and fits easily on the worktop. It’s white and silver in colour and has a capacity of 1.4 litres it also has a handle attached for easy movement. This Lakeland mini has 8 cooking programmes, you can cook white rice, brown rice, oatmeal, quinoa, cake, yoghurt, fast cook and slow cook. For a small multi-cooker thats a reasonable amount of options. 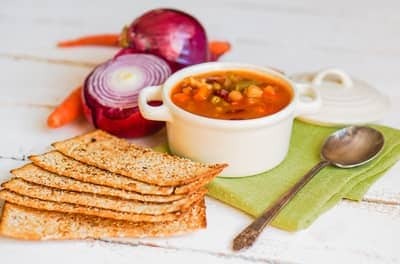 Make your stews using the slow cook function and you can even prove your bread dough with the yogurt function. The control panel is one touch with a led display to let you know the progress of cooking. When it has finished cooking there is a keep warm function that kicks in till you are ready to serve. The inner pot is 2litres in size with a non stick coating but as you can’t fill it to the brim for cooking the working capacity is 1.4 litres. It’s easy to clean with a removable inner lid and wipe clean exterior. At less than £50 it’s well worth a look. The Redmond RMC-M4502E is a 5 litre capacity multi-cooker, suitable for families. It’s black with a metallic trim, includes a carrying handle to make it easier to move from place to place and has a non stick inner pot. This multi-cooker has 34 programmes, 16 with pre-set times which are adjustable and 18 manual. It also has a multicook programme which you can use to set your own time and temperature so you can replicate any requirements for any recipe. You have the ability to prepare ahead because this multi-cooker has a delay timer and a keep warm function. With a bit of prep you can have a meal on the table when you come in from work. Unlike other multi-cookers it also boasts 3D heating which means it heats from all sides, bottom and top of the cooker. The RMC-M4502E not only comes with a steam basket and rice measuring cup but it also includes a deep fry basket so you can fry in there too. If you want as many functions as possible in a multi-cooker and don’t mind paying around £100 then this one might fit the bill. The Tefal RK302E15 is a neat silver and black multi cooker which is a smaller size with a capacity of 2.2 litres. If you have a small kitchen or don’t need to cook large quantities this is worth a look. 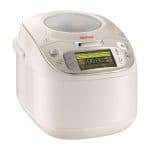 You can cook rice in this cooker, quick rice, white rice and brown rice. It comes with a measuring cup for the rice and the non stick inner pot is marked with levels for the liquid. You also have options for cooking grains and porridge. With a slow cooking function you can cook your one pot meals and you can also steam with the steaming function. The steaming tray is included to hold your fish or vegetables. You can even bake a cake with the dessert function. There is a delayed start function so you can set it up and have it finish when you are ready for it and it includes a keep warm function so that when it is finished cooking it won’t get cold if you’re not ready for it. At this moment you can get the Tefal RK302E15 Multicook 8-in-1 Multicooker for less than £70 at Amazon.co.uk. This Morphy Richards Intellichef is a white and black colour with a clear lid. It is a similar shape to slow cookers being more oblong than circular. You get a 5 litre capacity making it large enough to make bigger meals or cook larger pieces of meat. It has a removable non stick inner bowl and it couldn’t be any easier to use. There is a knob on the front of the unit which can control the temperature which you can adjust from 80C – 240C depending on what you want to cook. Using the knob you can select whatever temperatures you need, low to slow cook or high enough to deep fry. If you’re worried you don’t know what temperatures to use there is a booklet included with all the necessary temperatures required to use all the functions. You can steam with the steam rack included with the Morphy Richards Intellichef and it also includes 4 silicon poachers for eggs. Quick stew or slow cook and watch the process through the see through lid. Pre-fry your meat and vegetables at a high heat then adjust down for longer cooking. A different type of multi-cooker but versatile all the same. With a price under £50 it’s very budget friendly. The Sage BRC600UK multi-cooker endorsed by Heston Blumenthal is a compact stainless steel appliance with a glass lid. This is a medium 3.7 litre capacity, still large enough though for a family meal. This multi-cooker can slow cook at low or high temperature, it can make rice, it can steam, it can sear and it can make risotto. The inner pot is removable and non stick so it can be used to serve at the table if required and is very easy to clean. The controls are all on the stick out panel at the bottom of the multi-cooker. Easy push button controls and a start button makes everything as simple as possible and all functions have a pre-set time to give you the best results. To pre-fry your ingredients before the main cook just use the sear function then stop and start your slow cook or risotto, add the ingredients, stir and put on the lid to let it cook. Most multi-cooker don’t give the option of high or low temperature slow cooking so that is a good option on the Sage by Heston Blumenthal BRC600UK and the keep warm function after the cooking has finished keeps your food warm until you are ready to serve. If you’re interested this multi-cooker is selling for under £80 at the moment. If you’re looking for a large sized multi-cooker then check out this Crock-Pot Multi-Cooker which not only let’s you slow cook but also allows you to roast, steam, bake, saute and sear all in the one pot. It’s 5.6 litres in size and the removable inner pot is non stick and has handles attached to make it easy to remove and you can take it to the table to serve. There is a LED display on the front and function buttons to select what you want to do. Once selected you can adjust the temperature and the time to suit your own preferences. There is a steamer tray included so you can make your steamed vegetables or fish and you can also use that to hold you meat if you want to roast in the multi-cooker. You can also make rice and the measuring cup is included so that you can make the right quantity. Don’t forget you can even bake in this cooker, if the cake or loaf tin fits into the inner pot then you can use it as a mini oven. Use the saute function to sear your meat and vegetables before you slow cook and select whether you want high or low. Set the timer and get on with other things. The Crock-Pot Multi-Cooker is a bit more expensive at just under £100. The James Martin by Wahl ZX916 Multi Cooker is another endorsed appliance. It’s got a capacity of 4 litres so still large enough for a family and has a smart looking stainless body with a black lid. There is a non stick inner pot which is easily removed for serving and cleaning. With 6 cooking functions it allows you to do most things you might want at a touch of a button. You can do steaming, sautéing, stewing, cooking brown and white rice and make desserts as well. The controls are on the front of the multi-cooker surrounding the blue led display. Each cooking function has it’s own button and once selected you have the option to change the times to suit yourself. Once the cooking has finished the multi-cooker will switch over to the keep warm function so it’s always ready when you are. If you want to start your evening meal on a morning before work there is a delay timer so it can be ready when you come home. You can steam using the included tray which sits on the inner bowl so you can also steam some vegetables when you are stewing if the liquid is lower than the steam tray. Make rice in the right quantities using the rice cup included, the levels on the inner pot gives you the right amount of liquid to put in. With a price under £55 the James Martin by Wahl ZX916 Multi Cooker worth checking out. As you can see from our Top 10 Best Multi Cookers 2018 there are quite a few options you can choose from with different capacities and prices to suit the size of your family and your purse. Some have a few basic functions that might cover what you need others have more cooking options and let you have more control over temperature and time. Have a good look through and see if there’s one that takes your eye or check out the best seller of the moment.